Despite Marvel making leaps and bounds with tying their IPs to successful big screen ventures, television shows and perfectly-handled comic book retools, a lot of their stuff can be classed as “samey”. DC might be making it big by slapping a Bat emblem on anything vaguely popular and provoking irate fanboys with unexpected motion picture casting choices, but quite a bit of their output slides into “second verse, same as the first” territory. As I may have possibly intimated once or twice last year to people who only pretend to read my work, the real innovative gems in the comic book world are to be found in the indie stuff. If Twitter hype is to be believed, books like Lazarus are fast becoming the narrative of choice for those of us whose visual and textual taste buds range beyond a simple mish-mash of spandex-clad wrestlers flying around cities and invoking the ire of insurance companies by causing more civic damage than a tornadyphoon. I’m actually not going to review the first volume of Lazarus in my normal fashion this week – suffice it to say it’s a well-crafted, intriguing little epic springboarding from the creative mind of Greg Rucka (responsible for starting Batwoman’s well-received retool back in 2010) and the artistic talents of Michael Lark and Santi Arcas. It’s a dry, post-apocalyptic grunge-fest with a story about high-class families having risen to national power in the wake of some kind of catastrophic Facebook friend-culling that Mother Nature decided to enact in real life. There are vibes of Game of Thrones and Revolution poking through, with the merest dash of Dollhouse added for good measure. It’s an engaging, intriguing first entry to a neat little story that is well worth your time to read, even if it does follow East of West in terms of having a first volume that’s less a story in itself and more of an expositional orientation to the weird and violent world of the Families. Definitely check it out, if only to help support an industry in dire need of more exposure. On that final note, let’s get into what I really want to talk about this week; comics and cinema. For the purposes of this mini-digression, the term cinema encompasses both movies and television shows since more and more literary works appear to be being bastardised for the latter these days. Now, I’m one of the first to trumpet the successes of adapted shows like Arrow, Agents of SHIELD (not strictly an adaptation but obviously taking notes from the books in Marvel canon) and The Walking Dead, and it’s a credit to the writers and producers of those ventures that these works can match and, at times, surpass the quality of what they’re based on. Comics in particular seem to be being Shanghai’d onto our screens more and more, as anyone with a cinema subscription and a fetish for explosions can tell you. They’ve invaded the international market solidly for the last decade. In addition to what we’ve already got in the superhero arena, future endeavours will involve adapting Locke and Key, MIND MGMT and Thief of Thieves, all indy titles that have been met with varying levels of success from comic readers. There seems to be a clear push towards carving new niches from the in-roads made by these books, in an effort to spice up otherwise bland network television predominantly in America. With that in mind, it seems like a bunch of indy books these days are being written with a potential filmic adaptation in mind. Lazarus is one of them. It sounds kind of like I’m mentioning this as a negative aspect, that seeing great and effective characters like Forever Carlyle and that immortal Mexican bloke whose name I forget on our screens is something to be avoided. In truth, I’m not. Lazarus is a great story, and I’m sure with the right direction it could potentially make it big on television (I’d advise against a film, since the book’s complex mythology is already being comprehensively laid out in the first volume and to cull that down to a two-hour film could only be to the detriment of the original work). 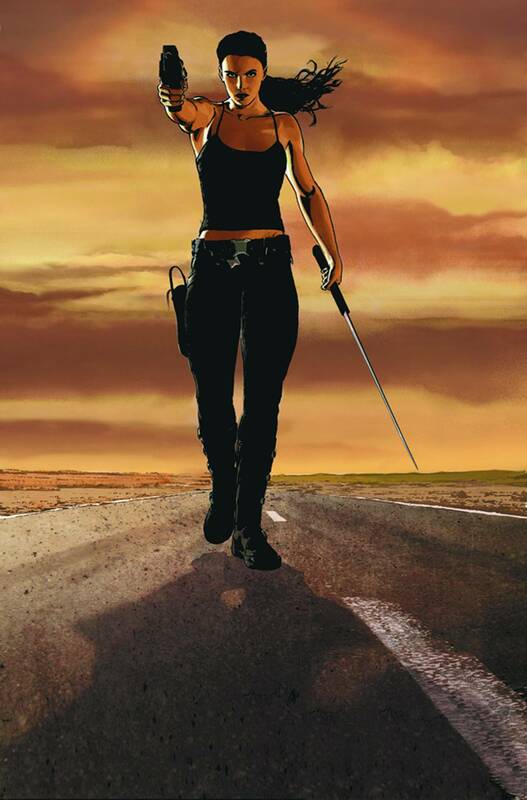 My problem stems from the unresearched, unverified belief I have that Greg Rucka wrote Lazarus with a lean towards that kind of adaptation work. I’m quite possibly making something out of nothing, and jumping to an illogical conclusion. 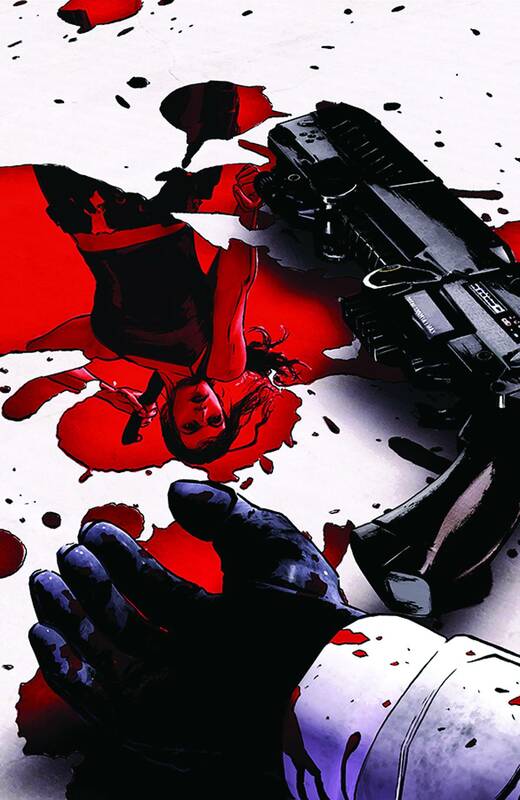 It could just be complete coincidence that Lazarus is paced, illustrated and written like a movie, with several action set pieces, a few good fight scenes and a couple of extraneous characters who might as well wear their two-dimensional motives on their scalps as Celebrity Heads labels. The relative brevity of the book – four issues in all – even makes it seem like the kind of project that could potentially fit into that two-hour format even if they kept most of the deeper layers of the story. Or, heaven forbid, as the first of a summer action trilogy. “But Chris,” I hear my five regular readers (not) cry out, “that’s just one example. Not all indy books are written like movies or TV, are they?” No, they’re not. Quite a lot of indy titles – most of them written by Jonathan Hickman, who has never allowed his works to be optioned for television – work better doing their own thing. Books like Chew and The Sandman would dilute the quality of the original work if someone ham-handedly tried to stick them in our living rooms, when they’re quite clearly written and nuanced for the medium upon which they’re published. Sometimes I even think Walking Dead would’ve done better off staying in comic form since the TV show’s immeasurable popularity leads to stupid decisions on the creative team, like keeping alive a villain who’s been set up to fall in the season finale because the actor draws viewers in with his haunting, macabre performance (and if you’re reading this, David Morrissey, please don’t take that as a swipe at you. I ❤ your Governor. Lots). But then you have books like Revival, with its rural noir undead setting and characters quite clearly modelled off old soap opera stock. You’ve got The Massive, which tries to be a global warming documentary with a slight LOST bent. Most egregiously you’ve got Great Pacific, one of the most droll books I’ve ever read partly because every single issue feels like it was hastily written for an Aesop-heavy television series that’s as toothless and unchallenging as most of the shows that a station like FOX would air. These are books that, to my mind, despite those varying levels of quality, they have undoubtedly been crafted out of a desire to one day see them as colourful moving pictures. It’s done at the expense of proper comic book pacing, and made less as a great story on paper than as a possible future cash cow for moviegoing masses to shove milk into. Like I said, it’s possible I’m pulling this supposition out of thin air. 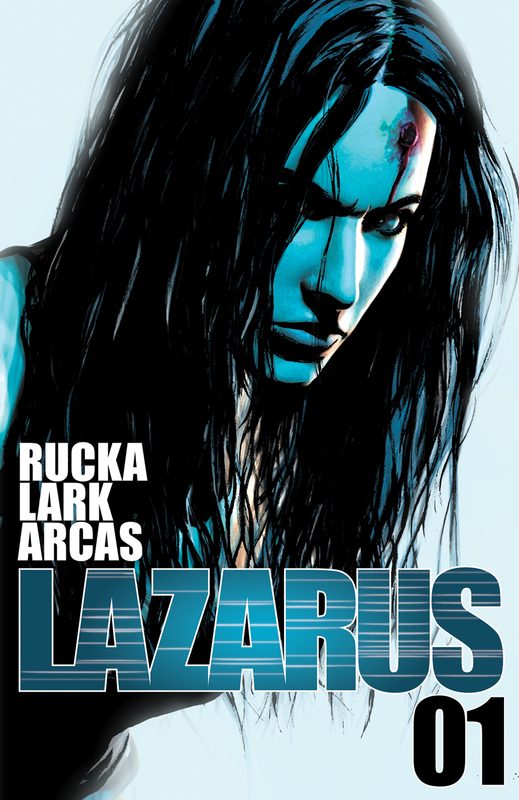 Lazarus could simply be the product of Greg Rucka’s excellently creative mind, and only resembles a movie out of crazy random happenstance. Whether it does or not it’s worth your time to read, and it’s definitely one of the more original titles in an indy market that seems more and more geared towards stories off the beaten superhero track. 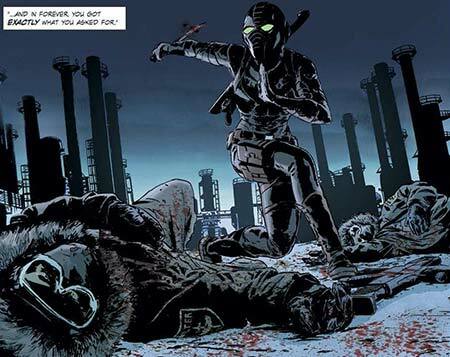 It’d be nice to know if books like Lazarus are written for comic books rather than for potential movies, since the former is a medium in dire need of more support as the tidal wave of motion pictures threatens to drown out the original blueprints. I hear a few upcoming books like Velvet and Pretty Deadly are shifting more towards reclaiming the medium a bit. 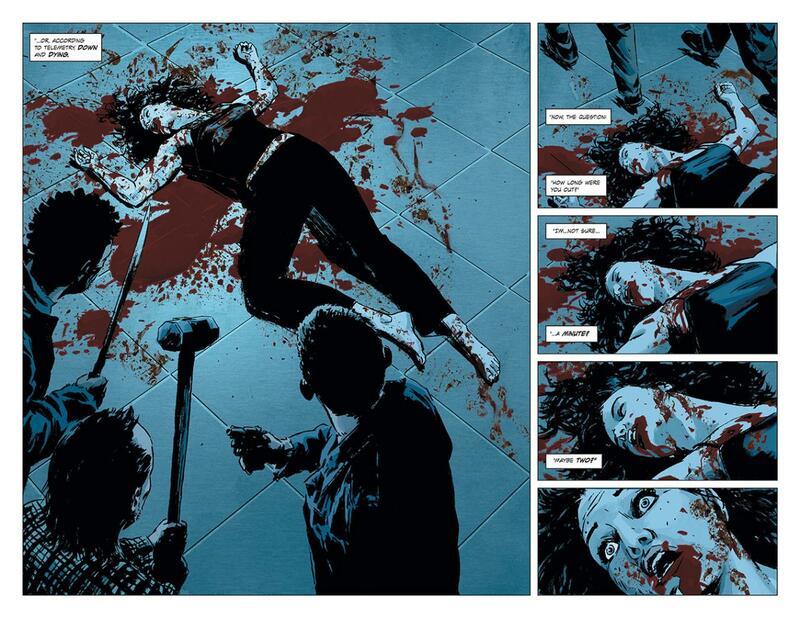 Whatever the case, don’t read Lazarus if you’re hoping to get on the ground floor of a fledgling movie fandom. Don’t go into the first volume expecting to say to future cinema audiences “Aww man, I was into this before it was cool!” Those are the kind of people I force-feed popcorn with a cattle prod.